Hôtel de Glace Québec-Canada inc. / Ice Hotel Quebec-Canada Inc.
(020213) It came from the 1971 Sears Catalog! The legendary Van McCoy site looks at the career of the late Van McCoy. Van McCoy was best known for one of the biggest hits of the Disco era, The Hustle was recorded with the Soul City Symphony during 1975. The US Swing Dance Server (http://www.swingcraze.com/ussds/swing_dancing.html) is home to the Hustle page  a lot of information on the different flavors of Hustle, including the New York Hustle. For many people, the idea of visiting a site that offers school bullies the opportunity to torment their victims again, decades after the fact is chilling. For those who participated, the so called bullies, Bullies Reunited is like a flying sand-filled day at the beach. Unlike many of the class reunion sites (one being ClassMates.com (http://www.classmates.com/) (SdJotD 000624)), Bullies Reunited bypasses all of that warm and fuzzy crap and makes it possible for certain visitors to feel the doom or false sense of power all over again. Stupid cry babies who are going to tell once they get their sorry asses up will want to avoid Bullies Reunited and instead discover other parts of the neighborhood on their way home. Places like Brace Face Boulevard or Four Eyes Lane, or the quickest of the way out of the way ways home, Opossum Parkway. Run you big stupid, get back to Cry Baby Street! Suggested by Reddog who wrote, "Know anyone that knits? They need Penguin sweaters." They did at one time anyway. The Tasmanian Conservation Trust has been assembling oil spill kits to aid in the clean-up of penguin colonies. It's the Little penguins (Eudyptula minor) that are affected. Spilled oil contaminates and reduces the insulating and waterproofing qualities of the birds feathers. As the penguins attempt preening, they rapidly become poisoned. The sweaters help absorb the oil and protect the birds from the elements. Before starting, please visit the Tasmanian Conservation Trust (http://www.tct.org.au/index.html) site for the latest news and information on the Penguin Jumper Project or any new knitting projects that come up. We are currently stockpiling jumpers to add to the Oil Spill Response Kits that have been developed by the Parks and Wildlife Service here in Tasmania. The pattern is found further down this page. Please note that this is an English pattern. US needle conversions are as follows: #10 = US#3 and #12 = US#2. With No. 12 needles cast on 50 stitches. Change to No. 10 needles and K2, P2 rib whilst increasing at the end of every row 6 times (62 stitches) then continue to knit in 2 x 2 rib until garment measures 15cm. Decrease one st at each end of every row until 36 stitches remain. In the next row decrease one st at each end and also one st in the middle of the row to leave 33 sts. Change to K1, P1 rib with Size 12 needles. Knit 11 rows and cast off firmly on Row 12. This is one side of garment. Make another and sew up from upper decrease to start of rib open for flippers. Add elastic to the top and bottom to prevent the penguins getting out of them. Top: 15cm of elastic; bottom 17cm (knots allowed). Cast on 36 stitches using No. 11 needles. K1, P1 to end of row. Repeat this row 7 times. Transfer the 54 sts from both pieces to 3 of the set of 4 No. 11 needles. (18 sts on each.) and work a round neck in K1 P1 rib for 10 rows. Stitch up sides to decreasing to 27sts (opening for flipper). Add elastic to the top and bottom to prevent the penguins getting out of them. Top: 15cm of elastic; bottom 17 cm (knots allowed). As Site du Jour of the Day turns five years-old today, the site for the International Museum of Surgical Science is once again featured as Site du Jour of the Day. A feature at the International Museum of Surgical Science site was instrumental in the name Site du Jour of the Day being settled upon for this project. Among the things that have remained constant over the past five years are the messages from individuals who ask whether or not I am aware of the fact that the phrase Site du Jour of the Day bothers them for some reason or another, and a feature at the International Museum of Surgical Science site. Ding Dong Ding. The INTERACTIVE ANTIQUE ILLNESS has been updated several times, but that simple bit of trivia remains. What a treasure it is too, it was the inspiration for the name of this project. 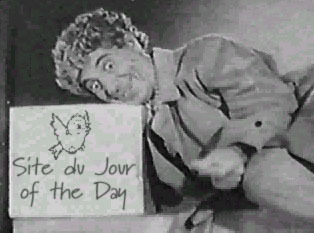 It started me to thinking about the song in question, the way the French Government was at the time desperately trying to protect the French Language from the Internet, and that many English language speakers wouldn't give a rat sass about the fact that the phrase Site du Jour of the Day would bother a few people for some reason or another. Some people actually find it all quite funny. The International Museum of Surgical Science was the first official Site du Jour of the Day and today is still well worth a visit. You'll have to look for them at Rocklopedia Fakebandica! but there is an entry for Stan and Yosh Schmenge, The Schmenge Brothers (see The Second City : History & Alumni (http://www.secondcity.com/02_02.asp?pid=02_01_03)), and there are entries for hundreds of other fake bands and performers from the silver screen and the tube. Fictional performers are the focus of Rocklopedia Fakebandica!, complete with brief biographies, pointers to other sites, and the occasional nugget of amazing trivia. While most of the material is from US productions, there is no limitation on origin. As seen in this entry, the acts were often real performers acting. In other cases, it was just the opposite. "Darlings, The - The stonefaced sons of the hillbilly Darling clan on The Andy Griffith Show. Possibly also known as The Darling Boys. They were played by real life bluegrass group The Dillards. They were in at least the three following episodes: 'The Darlings Are Coming' (3/18/63), 'Briscoe Declares for Aunt Bea' (10/28/1963) and 'Divorce Mountain Style' (3/30/64). Possibly they were in three more: 'Mountain Wedding' (4/29/63), 'The Darling Baby' (12/07/64), and 'The Darling Fortune' (10/17/66). They also appeared in the 1986 reunion TV movie 'Return to Mayberry.' Lineup: Rodney Dillard -- guitar, dobro and vocals, Doug Dillard -- Banjo and sang baritone, Dean Webb -- mandolin and tenor vocals and Mitch Jayne -- bass and acted as MC for the group and comic monologues. Father Briscoe Darling Jr. (Denver Pyle) would occasionally chip in on jug." Be sure to check out T. Mike's Interesting Medical Terms I've Heard That Would Make Good Band Names (http://www.vgg.com/tp/tp_020601_medicalbands.html) and the rest of the Van Gogh-Goghs site (http://www.vgg.com/). Recently, Site du Jour of the Day reader Kevin Clarke kindly wrote to share a family story, "Anyone who liked the Fabulous Ruins of Detroit would probably enjoy this too... Something I was reading recently reminded me of a story told by my father (who lived in London throughout his childhood) about the Brompton Road station on the London Underground. Apparently it was closed during the 1930s, but if you look into the darkness outside the train windows at the right moment you can catch tantalising glimpses of this 'ghost' station, frozen in time for over 60 years now. I decided to find out more on the web and stumbled on this fascinating site. See what you think." For many people contact with subway systems only comes through travel, the subways we know have been the ones we have visited over the years. Sites like Underground History - Disused Stations on London's Underground may be far more interesting and romantic for those of us who do not ride subway lines every day. That's not to say that someone who rides the London's Underground on a daily basis will not enjoy this site  it seems though that a tourist might find more enthusiasm than a commuter would over a section of a subway system that has been shut down. Underground History - Disused Stations on London's Underground offers a guided and often authorized tour of different parts of the London system, complete with photographs and an informative narrative. Not an official site, Hywel Williams has assembled a nice collection nonetheless.